This magnificent manor house in Suffolk boasts traditional outbuildings, a swimming pool and a tennis court. 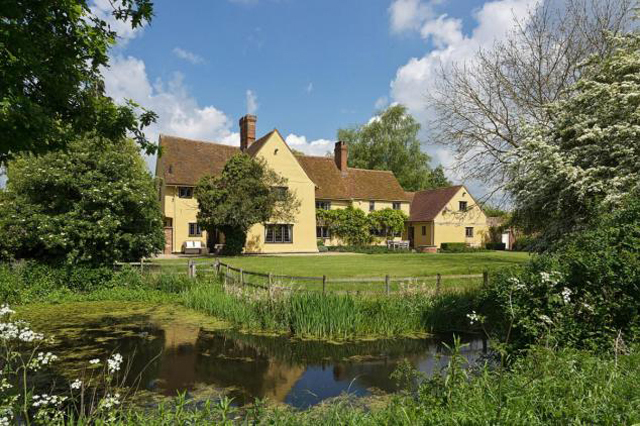 Ford Hall is situated between the much sought after villages of Lavenham and Long Melford in Suffolk. The Grade II listed property is beautifully placed at the end of a long drive surrounded by secluded mature gardens and grounds and features a magnificent moat at the rear. Believed to date from the 16th century, Ford Hall is constructed on a timber frame and plastered with a cross wing at the west end and a later addition on the east. The property has been extensively refurbished by the current owners to provide superbly presented accommodation throughout and was sympathetically extended in 2000. Today, it still retains numerous original features including leaded light windows, exposed beams and stud work as well as impressive inglenook fireplaces. 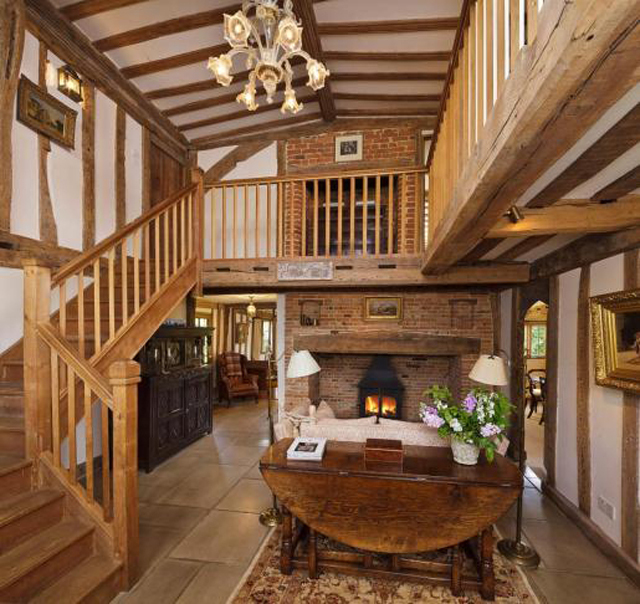 On the ground floor, the accommodation comprises a spacious galleried reception hall with inglenook and wood burner which gives access to the sitting room (that also features a wood burner), a dining room with open fire, a drawing room and an impressive solid oak staircase leading up to the first floor. The Aga kitchen/breakfast room offers a bespoke wooden base and wall mounted units with part wooden and part granite work surfaces. There is also a gas 5-ring hob and electric oven. The extension added in 2000 includes a rear hall, secondary staircase, TV room, utility room, cloakroom and study/bedroom 6. Upstairs on the first floor there is an impressive galleried landing, a glorious master bedroom with bespoke fitted dressing area and en suite bathroom, a further 4 bedrooms and family bathroom along with an upstairs study/bedroom 6.  Outside, there is a wide terrace along the rear of the property perfect for al fresco dining. Ford Hall is surrounded by 5.6 acres of beautiful gardens and grounds. The gardens are mainly laid to lawn with the moat surrounding the rear of the property. The grounds contain many fine trees such as copper beech, oak, silver birch and sycamore along with mature box hedging. 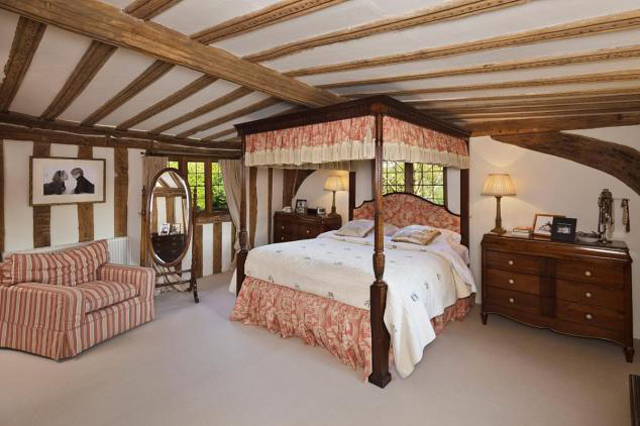 The property also benefits from a traditional range of outbuildings including a large timber framed barn, an office, 5 stables, stable yard, triple bay pool house with clock tower and wonderful fully self-contained cart lodge cottage. 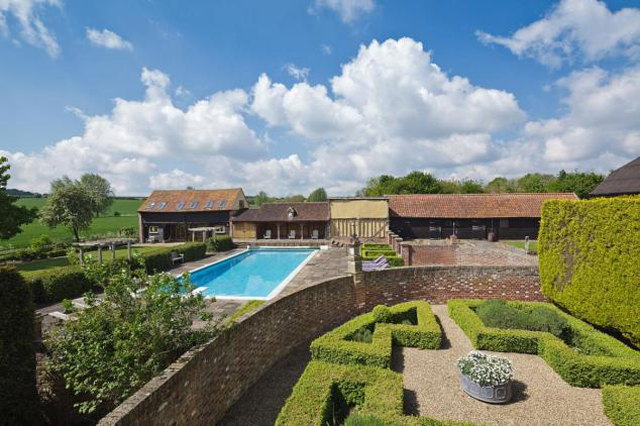 The swimming pool is located in a partially walled secluded area of the garden and the tennis court is situated on the other side of the timber framed barn. Ford Hall is superbly located and boasts easy access to the villages of Lavenham (2.6 miles) and Long Melford (2.6 miles). The historic market town of Bury St Edmunds lies 10 miles to the north. Lavenham is known as “Suffolk’s best preserved medieval village” and is regarded as the finest surviving medieval wool town in England with its winding streets lined with medieval timber-framed buildings, some of which have become shops, fine art galleries, delicatessens and restaurants. Long Melford is a particularly fine Suffolk village probably best known for its antique shops as well as the village green and Holy Trinity Church. There is an excellent range of shops, restaurants, pubs, three hotels and two Tudor mansions – Kentwell Hall and Melford Hall – both of which are open to the public. Perfect for the commuter, the market town of Sudbury (5.5 miles) provides a rail link to London’s Liverpool Street, alternatively there is a mainline service from Marks Tey (20 miles) or Colchester (20.6 miles) with the fastest trains taking 48 minutes. The guide price is £1.75 million. For further information please contact Carter Jonas on 01787 882 881.